A survey held by an Australian Financial Service company (Suncorp Metway, Ltd) ranked car accident claimants by their zodiac sign. The study involved 160,000 accident claims over a three-year period. This study, released in 2002 (data for 2010 by All State Insurance is below), was carried out as part of the Australian company’s annual review of claims. They said that they always look for trends in claims to see if there are ways to reduce their pricing, but there is no intention to introduce astrology as a rating factor for motor insurance - (good news for Geminis). 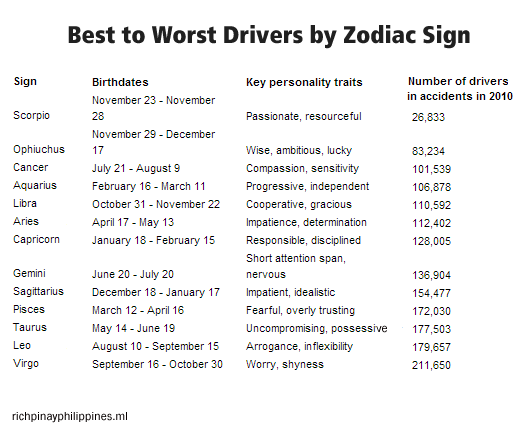 The top three best drivers by zodiac sign are Capricorn, Scorpio, and Sagittarius, while the worst three drivers by zodiac sign are Gemini, Taurus and Pisces. "There's something else fascinating about this list.The folks at SunCorp MetWay would have no way of knowing it but the signs in the tenth and eleventh positions are the exact opposites of those in first and second positions. This tells us a great deal about polarities, doesn't it? Scorpio is opposite Taurus and Sagittarius is opposite Gemini." Capricorn - "It's no surprise Caps are the safest behind the wheel. They're the safest at everything! Their patience and sense of responsibility are legendary. Imagine the thrill I felt when I divorced my Gemini husband and began dating a Capricorn. 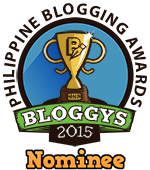 I couldn't believe how much safer I felt in the passenger seat." Scorpio – "Scorpios, on the other hand, may stay safe because they are intimately involved with the inner lives of others in the same way their opposite sign Taurus is defended against this information. Scorpios are sensitive to energy - whether it is a foot away or thousands of miles away -- and can feel someone "coming up from behind" at many different levels. Scorpios know if you've had a fight with your wife the night before or if you're thinking about embezzling or having an affair with your best friend's husband. That's why we always feel like they can see right through us. They can. Scorpios would be the drivers who would instinctively "wake up" in time to let a cocaine addict pass them at 90 or give a wide berth to a passive aggressive soccer mom hassling two kids in the back seat and a phone conversation with her husband all at the same time." Sagittarius - "Sagittarians may stay safe in their cars the same way they do in life, by having highly developed neutral or higher minds (Ninth House). Another name of this mind is intuition. The highly developed sense of flow and good timing characteristic of Sagittarians is what makes them the lucky sign. Furthermore, their minds are right at home dealing with traffic patterns, flow and spatial relations." Taurus - "Taureans can be obstinate and inflexible. But they are also the most introverted and self-absorbed of all the signs. Their natural path in life is to think about their own body -- its immediate comfort and needs -- and to deal with only the most tangible and immediate of realities. Their thinking as drivers may run like this. My stomach is full, the temperature in the car is pretty good, the noise level is good, I'm riding right at 60, I don't have to use the bathroom for at least another hour and there's plenty of gas in the tank. At a very fundamental level, the world outside the chassis of their car may not exist at all." "Since freeway driving requires spatial perception and processing of much abstract information (speed, flow and distance, this is counter to Taurus’ natural way of processing the world around them.)" Pisces - "Pisceans are the gentle dreamers of the zodiac. They may spend many hours a day in fantasy worlds, escaping the painful realities of life on the physical plane and more often than not the pain of being in a physical body. They often experience the whole manifest world as an illusion and their presence in it as temporary and of little importance. This Piscean detachment from the physical can lead to unconscious feelings of invulnerability or invincibility, also to unconscious feelings of victimization and sacrifice. If you are momentarily deluded into thinking you don't have physical limits, and that your life is but a fleeting moment in the eternal life of the soul, you can respond to situations of physical danger in illogical ways. Or, at the very least, be slow on the uptake." This data says that Virgos were nearly 700 percent more likely to be in a car accident when compared Scorpios - the best drivers in the study. Scorpios were only involved in 1.5 percent of all accidents in 2010. But, can an astrological sign really influence driving habits? Generally, the signs with the fewest number of reported accidents were those associated with traits like "compassion," "graciousness" and "resourcefulness" where those with more accidents tended to be more "uncompromising," "arrogant" and "impatient." We recently issued a press release on Zodiac signs and accident rates, which led to some confusion around whether astrological signs are part of the underwriting process. Astrological signs have absolutely no role in how we base coverage and set rates. Rating by astrology would not be actuarially sound. We realize that our hard working customers view their insurance expense very seriously. So do we. We deeply apologize for any confusion this may have caused. The interesting relationship between the two studies? Both Geminis and Virgos ("worst" drivers) are ruled by Mercury - the planet of intellect. I believe that this can be inaccurate. For a person to be a Scorpio, they must be born on within a range of 6 days a year, meaning that the chances of a baby being born a Scorpio [without any outside factors] would be approximately 1/61, while Virgos, the "worst" drivers on the list, can be born within a span of more than 2 months. 2 months is about 10 times as long as 6 days, and there were about 10 times as many reported accidents involving Virgos than that of Scorpios.